A brutally mutilated corpse. Strange-looking paw prints. A full moon. Take three guesses--and the first two don't count..."
Oh crap Dresden, You just seem to get deeper and deeper into it, don’t you? I absolutely enjoyed the second book, the different types of werewolves and Dresden's magic itself was much interesting than the first book. Considering that I choose the audiobook route (my first audiobook btw) it took me much longer to listen to it than it would be to read, besides this I still loved the audio book since James Marsters is the one that reads the book and his voice goes so well with who you think Dresden would be. 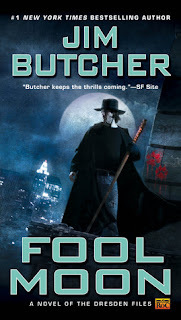 There were a couple of things that bothered me, one is that I wished Murphy and Bob were in this book a lot more, I love their characters and wish Butcher would have incorporated them more than he did. Another thing is the werewolf aspect, while I liked the different types of werewolves that are in this world, I still was bothered that they did not have the original type. There's a reason why it is a classic, and I missed that it was not in it. While I really liked the book, I wished Dresden would think before he does something. Constantly throughout this entire book I was wincing at what this wizard was doing to himself and his body. Honestly it was really hard hearing this through audiobook as I can drift off throughout the book. I will continue reading this series through audiobook, but I do prefer books. I'm also brand new to audio books - not really my thing but I got three free ones I want to read soon. This series is so popular but I only found the books so-so so far, have read the first two.